Are Sony's Android TVs worth buying? We compare against LG OLED. Both of these TVs are among the best on the market. But they look expensive in a competitive market and you can buy similar quality for much less. Sony’s new 4K TVs have launched and pose a threat to LG’s OLED technology with their High Dynamic Range (HDR) technology and relatively-low price. LG’s OLED TVs have stunned everyone who’s seen them... when they’re operating at their best. But they’ve been expensive and hampered by only appearing (until recently) with curved screens which have put some people off. What’s more, the price of the top models hasn’t been plummeting as we’ve seen with other TV technologies (LG is in competition with itself in the OLED space) and the price of a top, 65-inch unit (65EF950T) is still $8,999 despite its predecessor being $9,999 two years ago. Now here’s Sony with its new X9300D and X8500D range. Both offer HDR – which is basically better colour performance thanks to better light-sensor-capturing (in technical terms the colour gamut has moved from 8-bit to 10-bit). As Digital Trends puts it, “HDR allows a television to display a wider range of luminosity levels, including deeper blacks and brighter whites. The technology benefits colour as well by increasing the intensity with which colour is displayed.” The X9300D offers slightly-superior backlighting over the X8500D but that's the main difference. 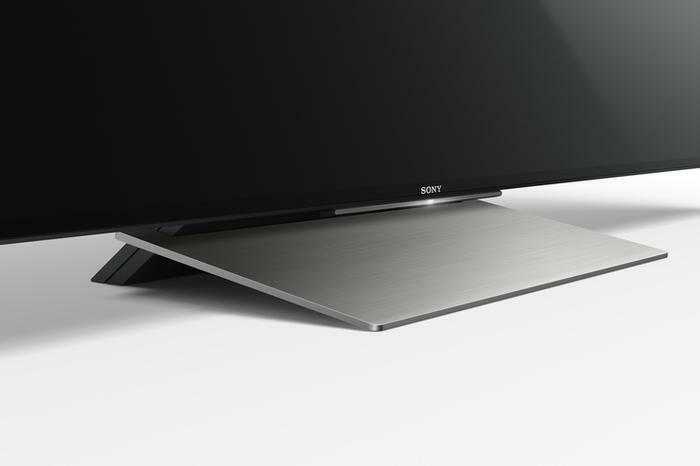 (Rumour has it that the X8500D is essentially the same TV as last year's flagship but Sony wouldn't confirm). Backlighting technology is now fantastically complicated with most lighting coming from LEDs at the side of the screen (rather than behind it) which change dynamically thanks to hard-working filters. This means the display can be even slimmer and the back doesn't need as much cooling, and yet somehow blacks can be even blacker when watching content. This week's new, all-encompassing Sony design ethos is called "Slice of Life." It makes the stand look kinda cool. The technology differs from OLED (which in many ways is an evolution of plasma TV) which only lights up areas the of the screen which have images on them – blacks end up totally black because there is literally no light appearing on screen. This differs with the LCD technology used by Sony and other manufacturers where light shines through a colour-changing layer of Liquid Crystal to produce the image. But how Sony has managed to keep the screen black at the edges and light in the middle using light-sources that come from the edges seems to defy the laws of physics. Ultimately, not much has changed with Sony’s new TVs in terms of video. The hardware is the same (theX1 processor). The main difference this year is the HDR. But that has also been made available to its high-end 2015 4K TVs (X940C, X930C, X850C, X900C and X910C) via a firmware update. Despite the complexity of the lighting technology, the LCD technology is still mature enough to undercut the price of OLED – a lot. The 65-inch X9300D model costs ‘just’ $5,999. Three grand cheaper? That’s quite a disparity! But is this the TV to buy? Or should you hold back?